There is a surge in the number of scholarships for UG students every year. The scholarships are disbursed by mostly three entities: government organizations, private organizations and NGOs/foundations. The central and state government distributes the major chunk of scholarship for Indian students. To avail central government scholarships for UG Students, students of any state can apply but the state government is restricted for that state domicile holder students only. The private organizations manage the scholarships under the Corporate Social Responsibility (CSR) Program. And, the NGOs and foundations are continuously doing their best in making society a better place to live in. If you are an undergraduate (UG) student, then here are few top scholarships for UG students which you can benefit from. It is a merit-based scholarship offered by the Academia Higher Education College, Slovenia. It is a 2-year higher education diploma program and a 3-year bachelor degree program in the fields of Engineering, Business and Media Production. Selected scholars will receive up to 100% tuition fee of amount EUR 12000.
Who is offering these scholarships for UG Students? It is a merit-based scholarship for September intake by Bath Spa University. The applicant must have scored at least 60% marks in class 12 and 70% marks in English subject to apply for this scholarship. It covers scholarship against tuition fee ranging from GBP 1000 to 3000 and offers placement opportunities. This merit-based scholarship offered by the Amity Global Institute, Singapore in collaboration with the University of London, University of Stirling and University of Northampton. The students who have completed class 12 can apply for this UG scholarship. About 35% of the tuition fee would be waived. It is a scholarship by the University of Strathclyde to study 3/4-year degree courses in Faculty of Humanities and Social Sciences. The student can also apply for the LLB courses. The selected students will receive a tuition fee waiver of GBP 3000. It is a scholarship for students who are having a conditional or unconditional offer from the University of Strathclyde, Glasgow. The students need to get enrolled in a 3-year degree course in any of the areas of Business Analysis and Technology; Business Enterprise; Economics; Human Resource Management; Hospitality and Tourism Management; and Marketing. A total amount of GBP 2000 per year will be provided to the selected scholars. It is a merit-based scholarship offered by the Nishkam Sikh Welfare Council, New Delhi in association with Sikh Human Development, USA. The students must have scored more than 60% marks in the previous two examinations to avail this scholarship. Also, the family income should not be more than INR 1.8 lakh per annum. The selected scholar will receive INR 30,000 per annum along with other incentives depending upon the needs, aspirations and courses. It is an initiative of the HDFC bank to support students who are not in a condition to bear the cost of education due to some crisis in the family, either social and economic. The selected students will receive INR 25,000 per annum against college and university fee. It is a merit scholarship funded and organized by the Department of Science and Technology (DST), Government of India for the students who are in class 11 up to the first year of graduation or integrated post-graduation. The students will receive a monthly stipend of INR 5000 to 70,000 and an annual contingency grant of INR 20,000 to 28,000. 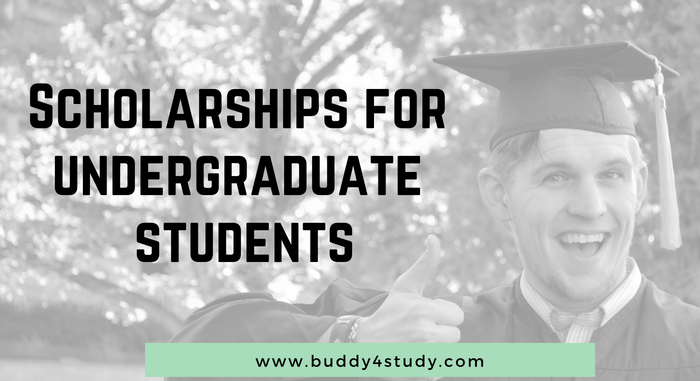 There are numbers of scholarships for UG Students listed on Buddy4Study and we will keep updating this space for more such scholarships that you can avail. All the best.